A Chinese spacecraft carrying three astronauts docked with an orbiting module Monday, another first for the country as it strives to match American and Russian exploits in space. The Shenzhou 9 capsule completed the maneuver with the Tiangong 1 module shortly after 2 a.m. ET, 343 kilometers above Earth. The docking was shown live on national television. Astronauts will live and work in the module for several days as part of preparations for manning a permanent space station. The crew includes 33-year-old Liu Yang, an air force pilot and China's first female space traveler. The docking was a first for Chinese manned spaceflight. In November 2011, the unmanned Shenzhou 8 successfully docked twice with Tiangong 1 by remote control. Monday's docking also was completed by remote control from a ground base in China. A manual docking, to be carried out by one of the crew members, is scheduled for later in the mission. Liu is joined by mission commander and veteran astronaut Jing Haipeng, 45, and crew mate Liu Wang, 43. About three hours after the docking the three were shown on live television entering the Tiangong 1, grabbing handles as they floated along in their blue spacesuits. They will spend at least 10 days in space on China's fourth manned mission, which was launched Saturday from the Jiuquan center on the edge of the Gobi desert in northern China. China is hoping to join the United States and Russia as the only countries to send independently maintained space stations into orbit. It is already one of just three nations to have launched manned spacecraft on their own. Another manned mission to the module is planned later this year. Possible future missions could include sending a man to the moon. The Tiangong 1, which was launched last year, is due to be replaced by a permanent space station around 2020. That station is to weigh about 54 tonnes, slightly smaller than NASA's Skylab of the 1970s and about one-sixth the size of the 16-nation International Space Station. China has only limited cooperation in space with other nations and is excluded from the ISS, largely on objections from the United States. 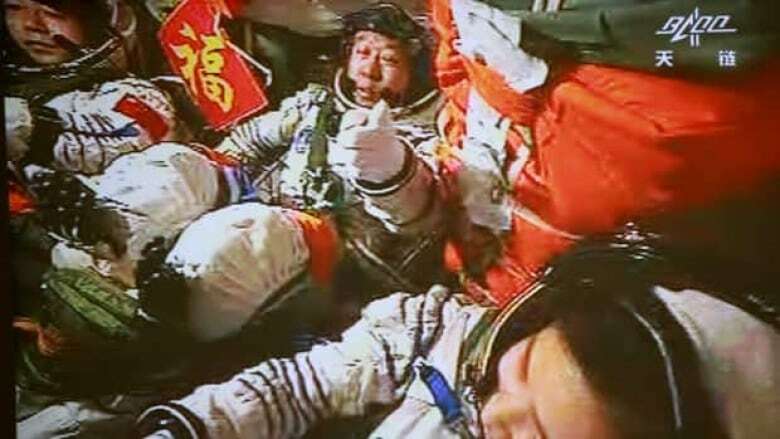 China first launched a man into space in 2003 and conducted a two-man mission in 2005. A three-man trip in 2008 featured the country's first spacewalk.